Two cool debt ceiling/deficit-related infographics caught my eye today. 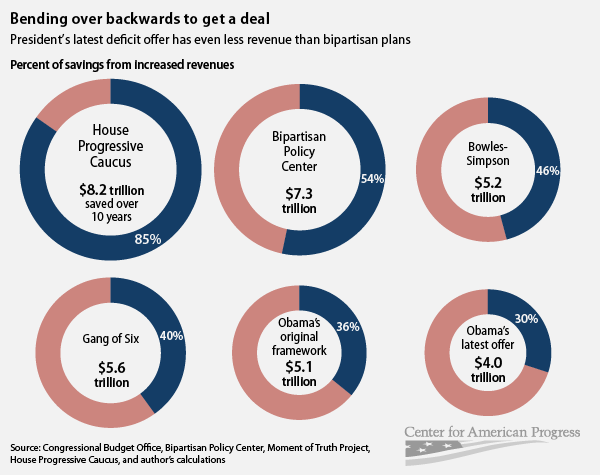 The first, by the Center for American Progress, shows the percentage of savings that would come from tax increases under various proposals to address the deficit, including those offered by Obama, the Gang of Six, and the Simpson-Bowles Commission. It backs up the assertion of Paul Krugman and other commentators that Obama has already given a lot to anti-tax Republicans and what he is now offering is actually right-of-center. The second infographic, from this weekend’s NY Times, shows how our two most recent presidents contributed to the deficit. Policy changes under Bush cost $5.07 trillion while those during Obama’s tenure added $1.44 trillion (projected over ten years). To be fair, Obama’s term isn’t over yet and so far he has increased spending at roughly the same rate as Bush: on average he has added $580 billion in spending for each year of his term, compared to $630 billion a year under Bush. Much of Obama’s new spending, however, was in response to the economic crisis and I think it’s clear that he doesn’t plan to continue increasing spending at the rate we saw during his first two years in office. This entry was posted in Data Visualization, Economic Policy and tagged Cool Graphs, Debt & Deficit, Long-Term Fiscal Crisis by Diana Brazzell. Bookmark the permalink.